We, the board members and team owners of the CIF, commit to proactively develop a league of stable and profitable football teams by demonstrating the highest level of integrity and professionalism. We will strive to provide our fans, sponsors, business partners and communities with as much value and quality as possible while maintaining the highest standards of business practices. INTEGRITY:To operate with a great sense of integrity both in internal league matters, and in our efforts throughout our home cities and the national football community. 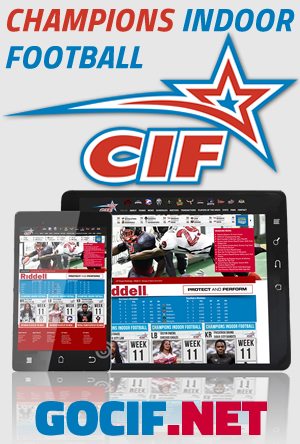 STABILITY:To grow increasingly Stable over time in efforts to ensure that CIF football will bless our fans and home communities for many years to come through careful valuation of new teams and market places, sharing of best practices, and the overall maintenance of an excellent business model. PROFITABILTY:To maintain reasonable budgets and focus passionately on growing both ticket and partnership revenues in efforts to be a league of profitable teams who grow roots in their communities. SERVICE:To consistently serve our Guests (Ticket Holders), Partners (Corporate Sponsors), and Homes (Communities in which we Play) with Excellence while providing a high quality product and great value.